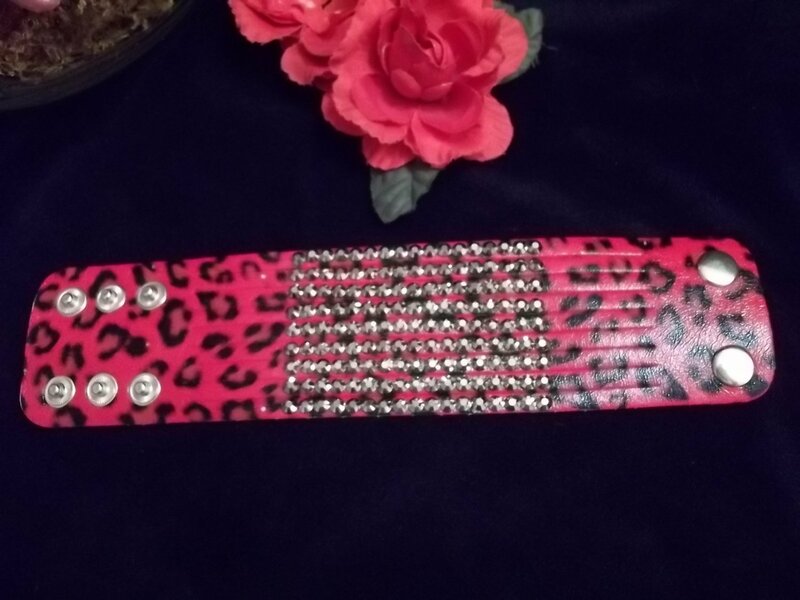 Red Leopard Print Leather Rhinestone leather bracelet. Has 3 button closing so you can adjust it. Would make a perfect gift. These bracelets are very popular right now. This bracelet is very shiny and with all the rhinestones on it it is guaranteed to sparkle! You will not be disappointed! Take good care of This bracelet and it will last. FREE SHIPPING TO MOST COUNTRIES!! Simply just put karma-boutique@live.ca into the search bar and our name is Lovethis Jewellery-Bee. **If you do add us on Facebook you will receive a free gift with your first purchase. If Purchased Please Provide Payment within 3 days. We prefer Paypal but other major credit cards accepted. Item is shipped within three business days of payment approval. Please allow ample shipping time depending on the item destination, your patience would be appreciated because we are dealing with "Snail mail" :) We offer free shipping to most countries and in order for us to continue to offer this service to our customers it is no frills shipping. If you have ANY problems, concerns or questions please contact us for a prompt response. Once the item has arrived we would appreciate Your feedback and rating. As we are an online store We depend very heavily on customer satisfaction and good ratings. Before leaving negative or neutral feedback please contact us. Thank You for viewing our item. FEEL FREE TO CHECK OUT OUR STORE AND HAPPY SHOPPING!